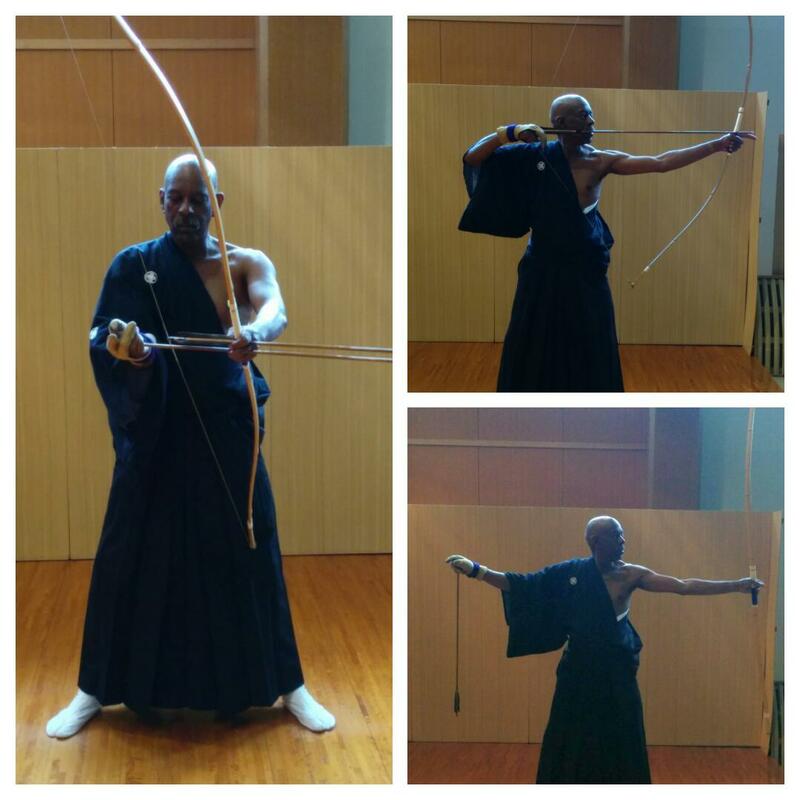 I have not posted about Kyudo in a while. I am still at it, but just quietly practicing. Working on correcting my weak points. It is a struggle. I think I changed something only to find out the correction makes something else go out of whack. My two biggest issues , beside not hitting is my right shoulder and my knees. The knees have nothing to do with shooting but it does give me concern, I need to learn the standing form…soon! The shoulder is a concern, it does not keep me from shooting, but it does keep me from looking good. I am alway told about. The problem is it tight, I tend to raise it I am told. I am unsure if it is due to the old benign tumor I have been told I have in the chest shoulder area or not. However if I really really focus I can lower it to the approval of the Sempais. Anyway, yeah I am still working at it. Some good news for me, I finally got my new Yumi, a yonsun from the States. 14 kg. a Symanski Bow, Kyoto style. I finally got to shoot it after having to wait for several days due to work. Smooth. After shooting with glass for several month, I can really tell the difference. It was a good choice. The only issue I had with it was, getting the string adjusted to the correct length. The cost was half of what it would have cost me for a made in Japan Yumi. 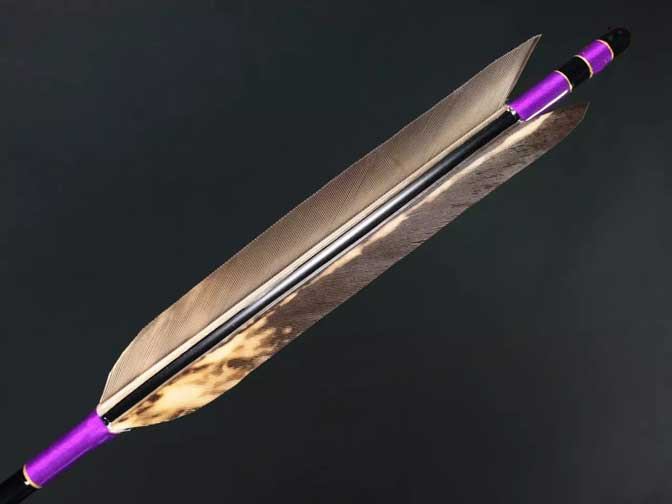 With the saving, I ordered a set of new Ya, with black Eagle feathers. A step up but still reasonable, plus new strings, a mix hemp/ syth blend. So my equipment is stepped up now I just need to do the same with my skills. I feel that too is slowly happening, I need to persevere, spring Shinsas are not that far away. There maybe a fairly sizable group coming from the states to test this year, people I know. It will be nice to see them. I had a pleasant surprise the other day, I was contacted by a former classmate from Ca. He is living here in Osaka now, as is another classmate. This one is living in our old area of Osaka. 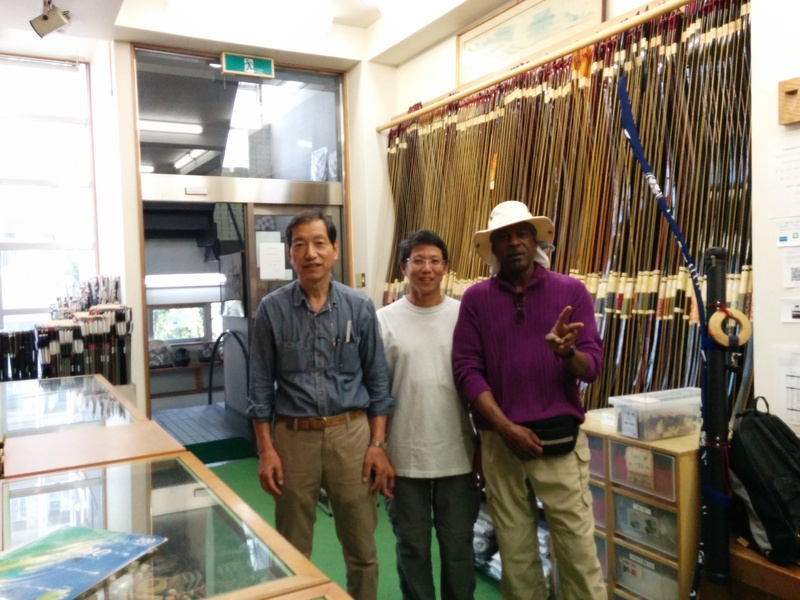 We met over at Ikai Kyudo store, and caught up on things. Interesting he had the same opinion about same people we know in the states, we never met together, so had separate encounters with them. So it is not just me. Well anyway, I told him all the Kyudo people I have met in Japan have been helpful. Any dojo you join will be good. He is looking to join one that is near him. I have attended there and have a sempai from Nagomi Sensei attending there. I was giving my classmate some advice on choosing a bow whilst in the Ikai store. Mostly about choosing a power size. The owner, a Go-dan was listening and agreed with every thing I said. I guess I have picked up a few things in my time spent. I have heard over the years, do not draw a Takai Yumi and then let it go without an arrow in it. However I have read that using a hemp string when it breaks using a Takai Yumi it refreshes the Yumi, the Ikai owner said the same thing. So What is the difference between breaking whilst shooting or shooting with no ya? Ahh perhaps because it is fully open when the string breaks. I have about a month of waiting time before my new Ya are ready. My orginal plan for my shooting colors where black and Purple. I have modified that to Brown, Black and purple. Different but not too flashy, sort of shibumi. Yeah, no one really cares though but me, the artist trip thing. And thats the local news. My last visit to Snafkin I was told that my co-worker from Aoki Yachts was going to be playing there on 10/10. I made a mental note to attend. I spoke with her a couple of times at the office and told her I was going. I arrived at the club just after the show started and greeted everyone. It felt kind of like the show “cheers” going to a place were everybody knows your name. There were only my co-worker and another woman playing. I ended up handling the sound board because they kept getting too much feedback. Things were too loud for that small space and had been set with too much reverb. The other woman with my co-worker played piano, guitar, and Okinawan Shamisen. It is not called shamisen, but I can never recall the name. Something like Shami. No matter. They played a few songs then took a break. Another co-worker showed up we all chatted a bit, before the next set of songs. I liked the tunes, simple but catchy with The “Shami”. The differences between an Okinawan Shami and a Japanese Shamisen are Japanese version is longer and made from Cat skin, and played with a type of paddle that looks like a rice spoon. The Okinawan version is made from Snake and is more decorative and played with a small horn/ pick sort of thing. The Japanese version also gets some percussive sounds from the paddle as well. Maybe I will get some lessons later down the road. Right now Shakuhachi is the challenge. So the last song can up, I had been asked if I could play bass on that, I looked over over the sheet music and agreed. The type was too small for me to read from the spot I was in next to the other player, so i just followed her chord changes she was doing whilst playing. I already know what the basic cord were so it was pretty simple to follow. They were quite pleased with the results and asked me to do another. I agreed, it was fun and the results were nice. 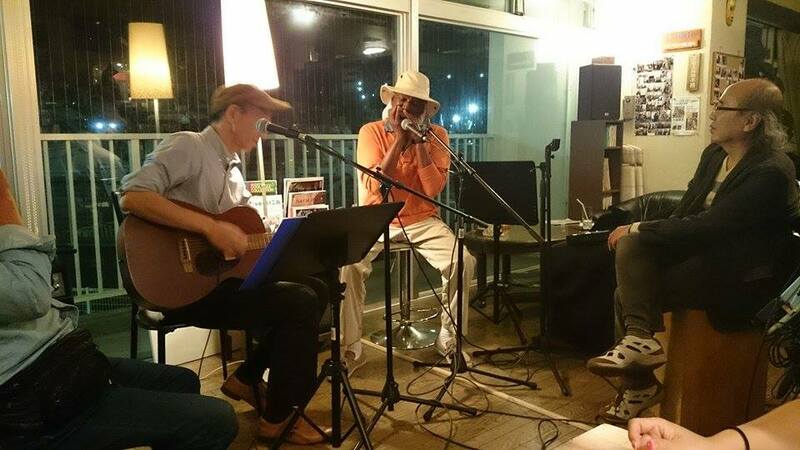 We joked about how we sounded like a Okinawan Blues Band. They were done for the evening. The owner cleared the stage area and sat up his guitar and music stand. He said the stage is now open for anyone, and gave me a look, which i kind of ignored. My sempai motioned for me to play piano, i declined. The owner started to play a song, a Japanese song, which one of my Kyudo sempai knew, he sang along. I played on the box-drum type thing, “Cajon” to give them a beat. Afterward the owner said something and I responded I did have my harps with me. He and I did a couple of songs together. Afterward he motioned for me to take his chair and guitar and stood up. Hmm. I changed seats and picked up his guitar. I felt it out a bit and figured I would do one song. Something I had not done before but it would be interesting to give it a go. As no one knew what I was playing whatever I did was ok, that gave me a large amount of freedom, to just play as felt and relax. I started off easy just getting my groove. Slowly my old solo Cafe background kicked in and I just went with it. It went well and folks liked it. The one other “Gaijin” in the room came over afterwards and introduced himself. He was from England. 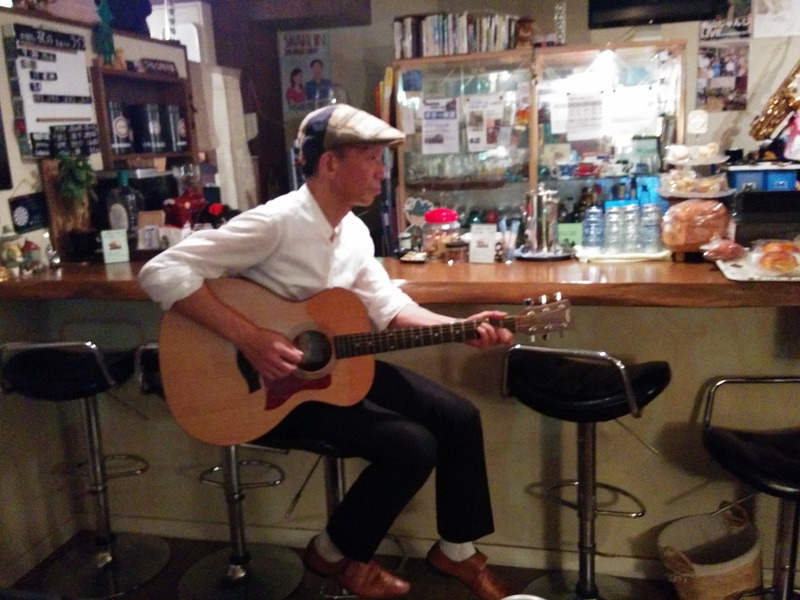 He lives locally with his wife, Japanese, who plays Cello. We chatted a bit. He seems like a nice enough chap. He told me of a few local places I maybe interested in. By now it was getting on in the evening and I did not want to make a mad dash for the train. Therefore I started gathering my stuff. Seemed like others took their cue from me and also started making ready to leave. One of my sempai offered me a ride to the station near my home. It was a good thing as it started raining once we went outside…hard at times. It was a good evening. I will return there again end of the month to hear the woman sax player I was impressed with a while back, the famous one. She will have a keyboard and bass player with her. So I will just bring my harps, and a couple of music charts. I was asked by my Kyudo Sempai, the one who lent me his Shakuhachi to play on a song with him and the other Sempai at an appearance at Snakfin. I agreed of course. I like the Snafkin club, I felt I owed him, I liked the idea of expanding my musical gender. Even though it was a western song, from West Side story, one of my favorite musicals. Still Shakuhachi, Bass, and guitar had been something I had been thinking about for a while. As it turns out later that song was changed to a song from the Titanic. No matter. Then that one song was changed to five. Ok, I was getting more pumped about it. One of the songs was a Japanese song, maybe two of them. I arrived at the club just a little late as they were sitting up. I was surprised to see the place empty except for one table of folks, which turned out to be other Sempai from the Kyudojo and their husbands. We all greeted and I got ready to play. We did a couple of songs, without problems for the most part. No rehearsal for me, just reading off a cord chart. Fairly simple stuff so not a big deal. It went ok. This went on for several songs, then i was asked to do a song, ehhhhhh. Ok, after some hesitation as i was not ready. I sat at the piano and did a short blues tune. Most were shocked I played piano as well. 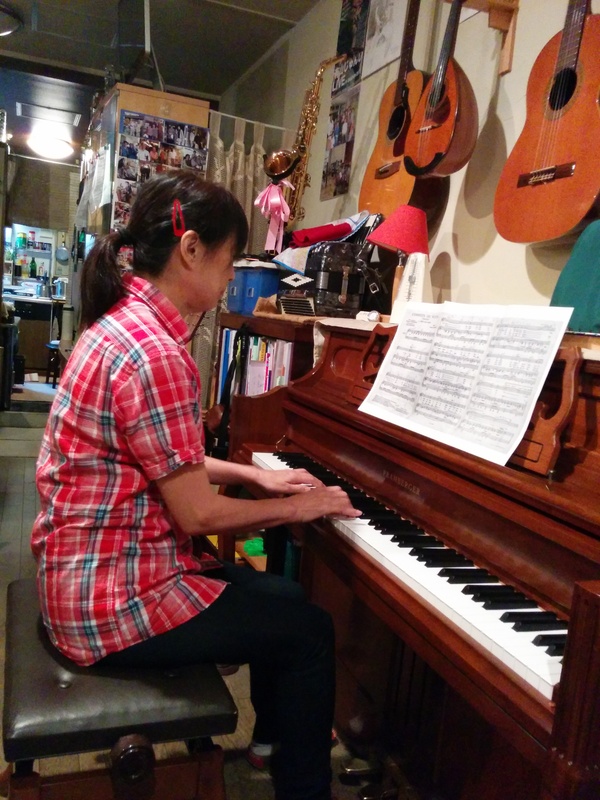 Then Sempai played a solo shakuhachi piece, lastly the owners wife on piano and sempai played the song Tonight. I was given the chart by the other sempai and softly played along. It was a fun evening. Once over everyone was getting ready to go. The owner asked me to stay a while and hang out. I agreed. We chatted, played a little and had a nice little mix. I was asked to have a picture taken so they could put it up on their wall of performers, as I was the #2 celebrity of their little club . A nice complement, not really true but still a nice thought, so I agreed. I was told a couple of other people who I knew were coming in later in the month, if I was free please come back. One of which is a really good Sax player. I had meet her before. I liked her sound. She is the number 1 celebrity. Several people i have encountered spoke of her. Including my medical Doctor who knows her. He shocked me on my last visit by showing me a picture of me on a club ad with her. They are friends, also a couple of people with the Jazz band know her, one of who has taken lessons from her. I am looking forward to playing with her again. She will have her Bass player, however, I will bring, my harps and perhaps sing. The other person coming on the other date is the woman who plays shamisen who I work with at Aoki Yacht school. I wish i was good enough to play Shakuhachi with her, but I will bring my Bass that night and sit in a bit. 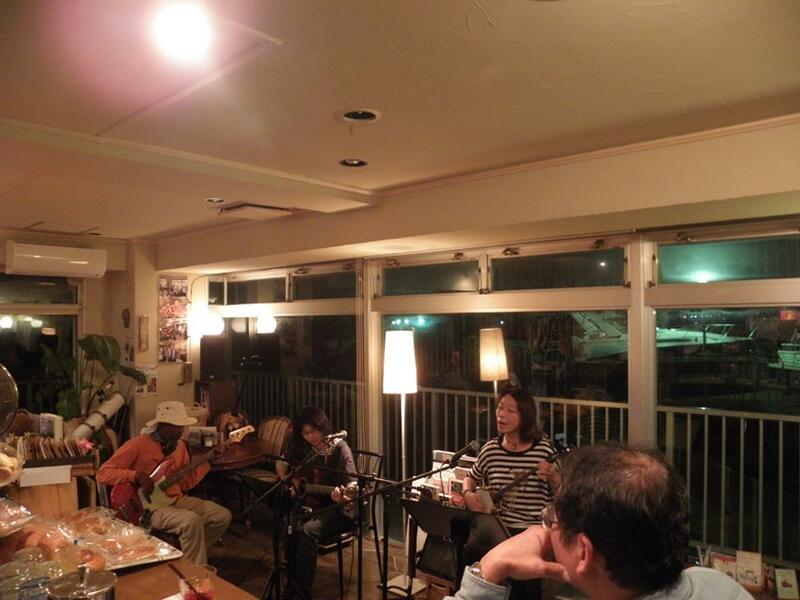 Her band, well a portion of the band will be doing some Okinawan songs. I have wanted to play something different. So yeah, it was nice to hang out a bit with the club owners. We talked and jammed a bit together before I needed to catch my train. The husband gave me a ride to the train station afterward, so it was easy for me to get home, from the first show of the Kishiwada Kyudo Music Ensemble. There has been a lot of music stuff going on since my last music post. Along with other stuff, I have been too busy to post. Rather than do separate post now on all the stuff I will condense it…with what I can remember . I returned to the Jazz band for a second time. I was more aware of what was happening, so more relaxed. 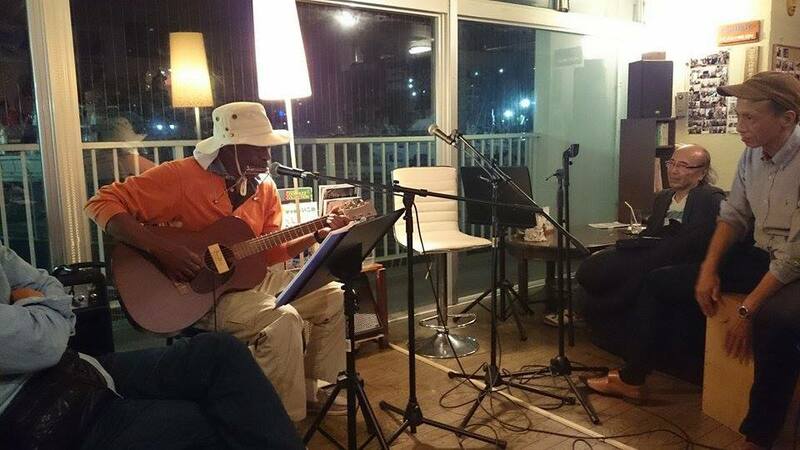 I had a couple of songs prepared to do with the group. I had sent in a youtube link of them and prepared a chart for the group to follow. Still it was a bit rough as would be expected with no practice, just here is a chart, this is the beat, blah blah, ready set go. It for the most part turned out ok. I did a funky version of Summertime, ala Marcus Miller, also St James Infirmary and Watching the River Flow. None were perfect, but after the groove was settled into it sounded fairly good. The crowd liked it, and the players got into it after we got the groove going. Now that I was more relaxed I joined in on a couple of other standard Jazz tunes, with singing. I had never really thought of myself as a vocalist, l but I am starting to get comfortable with doing it and sometimes even impress myself, stepping outside of my comfort zone. Another return to the fellowship, I was rather pushed for time with other things happening so only prepared two songs this time. They were a bit more complex, Watermelon man and St Louis Blues. Both via Herbie Handcock arrangements. They did not go as well as I thought/ hoped or I heard in my head, but again once everyone settled into the songs it turned out ok. The thing is since this is all about just fun and music practice it does not matter if there are mistakes and flops. Having heard me play harmonica last time on a Jazz tune, I was asked again this time to play along on Harmonica on a Jazz tune. Not bad, not great but ok, even more so considering I am using a blues Harp not a chormantic. I did not sing as much this time, just a bit. However I am feeling more comfortable with these folks and enjoyed watching and listening and making a couple of new friends, we exchanged Facebook data. Another nice thing about this club is the fee is only 1,000 yen for us to be there, and that includes one drink and also food! The owner puts out a bunch of finger foods for us to munch down on. The owner is alway very kind to me, well most clubs I go to the owners are nice. This guy looks like he is low level Yakuza, but I like him, he is cool.